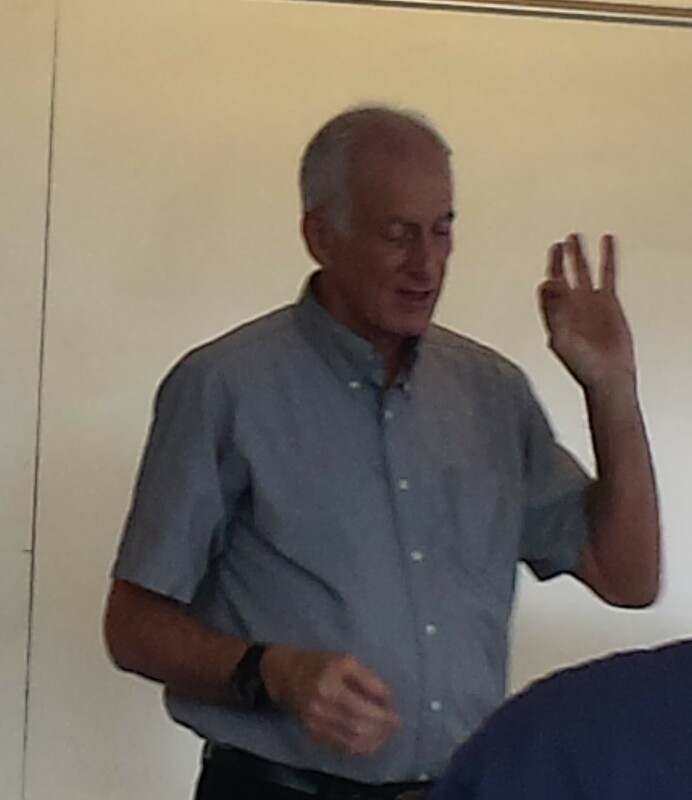 How often have you had a real-life astronaut come talk to you in class here at Tufts? That is exactly what happened last Friday in the robotics class that I’m helping to teach, and I’m still reeling from the experience. The class is one of the many Introduction to Engineering courses that freshmen engineers can choose from, and it’s a fun class that teaches key software skills and engineering design. As one of their weekly projects, the students get to build a robotic tool for astronauts conducting Extravehicular Activities (EVA). So we brought in Dr. Jeffrey Hoffman, who conducted 5 shuttle missions between 1985-1996, to talk about his experience with EVAs and space robotics. Even as a keen space enthusiast since childhood, Dr. Hoffman had never considered becoming an astronaut early in his career. Back in his day, astronauts were solely military pilots, whereas he was drawn more towards science and research. He studied astronomy at Amherst College, and later obtained his doctorate in astrophysics from Harvard. Following his career as an astronaut, he is currently a professor of aeronautics and astronautics at MIT. Dr. Hoffman flew on five space shuttle mission, including the first mission to repair the Hubble Space Telescope. 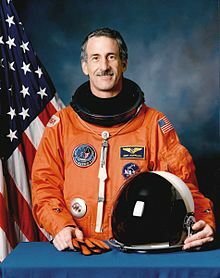 He was also the first astronaut in history to log 1000 hours aboard a space shuttle, and he also holds the honour of being the first Jewish astronaut. Dr. Hoffman talked at length about the sheer amount of preparation that goes into becoming an astronaut, with underwater training regimes, trial runs wearing a space suit that weighs hundreds of pounds, and the intense technical training to perform under such extraordinary circumstances. This preparation isn’t limited to the physical. He described how much mental preparation an astronaut requires to essentially rewire the mind and body to function without gravity. In the absence of gravity, and all sense of weight and direction, the astronaut must re-learn how to think, move, and even speak. What’s up or down to the astronaut on an extra-vehicular mission may be left or right to the rest of his crew, and the slightest miscommunication may result in a catastrophe. Moving on to the subject of the day, robotic tools in space, Dr. Hoffman detailed how insanely difficult it is to perform precision repair work in free fall. An astronaut must be tethered to a surface so as to avoid floating away in zero gravity, which restrains your freedom of motion significantly. “Imagine trying to tie your shoelaces, but with a friend and with both of you using only one hand,” he quipped. This is why space robotics exists. In addition to dealing with the physical and psychological disorientation of being in outer space, an astronaut has to focus on so many minute details about the mission that it’s nice to have an extra arm or two help around. 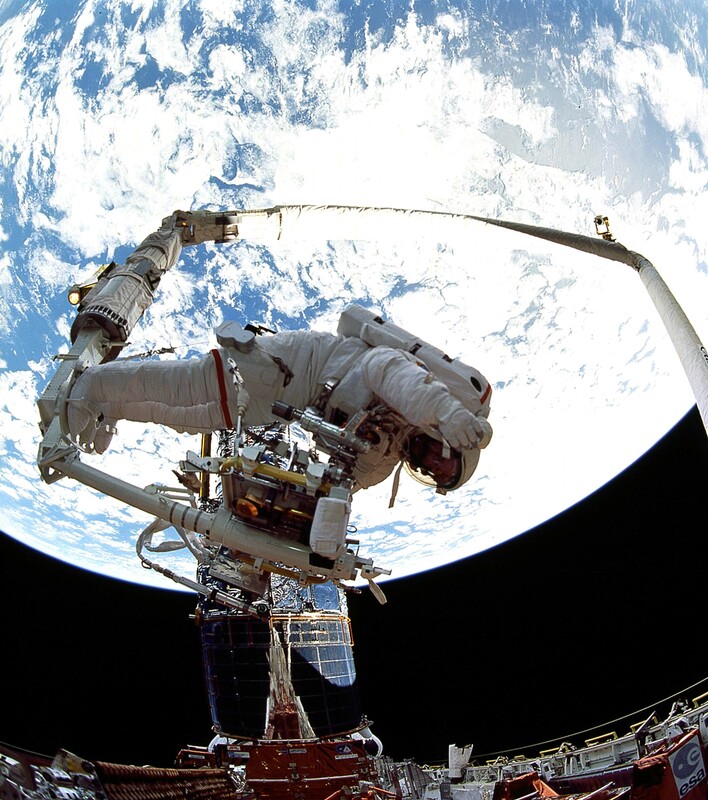 Dr. Hoffman related one of his favourite memories of working with the shuttle’s Remote Manipulator Arm during the Hubble repair mission. On one EVA, the astronauts had to remove tiny 2mm screws from a computer systems panel so as to effect repairs. Each astronaut has a ‘trash pouch’ attached to the front of their suits to contain any free-floating material that they accumulate on an EVA. However, whatever was put in the pouch would float out the moment it was opened, and inevitably, one flew out as Dr. Hoffman’s partner tried to reach in and deposit a new screw. 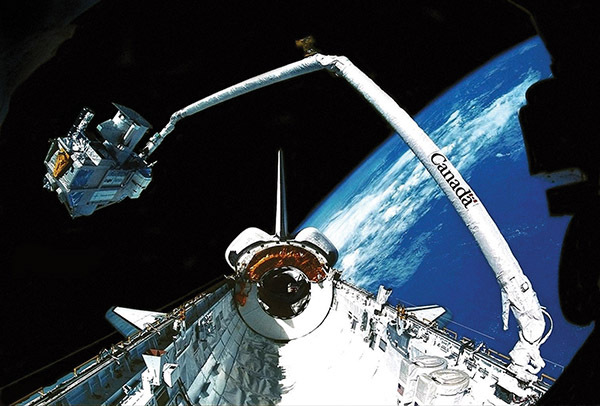 Being tethered, neither of the astronauts could reach far enough to re-capture the screw, but thinking on their feet, they decided to chase after it with the shuttle’s robotic arm so that Dr. Hoffman, who was at the time tethered to the arm, could extend its reach and capture the screw. This all sounded great in theory, but when they actually tried chasing after it with the arm, no matter what they tried, the arm could not catch up with the screw. Even at full speed, Dr. Hoffman was a frustrating couple of inches away from it. But then, in a moment of inspiration, the astronaut controlling the robot arm realized that the robotic arm’s maximum speed was limited since it thought that it was carrying a load. So, he quickly reprogrammed the arm to think that it was unloaded and the arm immediately reached a higher speed. Screw saved, day saved. Dr. Hoffman fondly refers to the incident as the ‘great screw chase’. He also highlighted one of the deeper implications of that particular experience. No matter how far technology advances, the human element is indispensable. Even in such an extraordinarily critical situation, the operating astronaut had a valuable insight and a creative solution that an autonomous system could never have achieved. Compared to his day, the field of robotics has progressed in leaps and bound, but he stressed that the value of human expertise and capacity for lateral thinking is still just as relevant. Having grown up reading volume upon volume of Asimov’s and Clarke’s space tales and dreaming of one day reaching the stars, I was truly awed at meeting somebody who has actually been there, taking that one step beyond our pale blue cradle, reaching out to the infinitely mysterious cosmos. Can we all one day reach the same heights, given the ‘privatization’ of space? That was one of the many questions posed by the students of the class at the end of Dr. Hoffman’s lecture. We may, we may not. But I for one would happily die trying. For what are we, to quote NASA’s Dr. Michelle Thaller, but dead stars, looking back up at the sky?